SUMMARY: As a sort of Hunger Games meets "The Bachelor," The Elite continues the story of 35 girls vying for the hand of Prince Maxon. Now down to the final six contestants, political unrest ramps up. America Singer is still torn between her first love, Aspen, and Prince Maxon, for whom she has growing feelings. 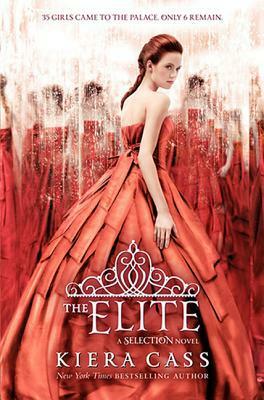 REVIEW: I mostly enjoyed The Elite, but for me, it doesn't have the "wow" factor that I experienced with The Selection. Chalk it up to overly-high expections, probably, but I came away feeling underwhelmed and more than a little irritated with America. Make up your mind, woman! America vacillates from Maxon to Aspen and back and forth a hundred times by the end of the book. It's just exhausting. I did enjoy the political unrest quite well, especially America's little trick toward the end. I liked getting to know a bit more about the king and the previous ruler, Gregory Illea. While it took about 100 pages for me to get into the story, it was mostly fast-paced. I would have liked to see more action, however. Taken as a whole, very little actually happens save a few major scenes. And a lot of thoughts/discussions about America's feelings toward Maxon or Aspen. Zzzz. My big question with this book/series--WHAT is the genre? It's in the future, which would seem sci-fi, yet there are no high-tech gadgets or flying machines or trips to another planet. There is no time travel and no world-wide disaster. No major medical advancements or plagues. With the regency, big poufy dresses, and antiquated gender roles, this feels more like a princess story than sci-fi. Romance would maybe work, but I typically classify pure romance as something more contemporary. Any ideas on that? THE BOTTOM LINE: While I'm underwhelmed and annoyed with America's incessant indecision, I mostly enjoyed The Elite. I definitely plan to read the final installment, The One, out sometime in 2014. STATUS IN MY LIBRARY: Six copies on order. I have lots and lots (and lots!) of students eagerly anticipating the arrival.